I can’t believe I haven’t written about my favorite yard tool – my push reel mower! My neighbor has one, and it’s so quiet and odor-free that I had to try it. I fell in love instantly. The whirring sound of the blades is actually kind of comforting. This mower is so easy to use, even I can use it. When we brought it home, and to this day, my husband and I almost fight over who gets to mow the lawn. I’m not kidding! It goes like this… “I’ll do it.” “No, that’s ok. I can mow it.” “No really, you go inside. I’ll mow the lawn.” Finally we agree to split and each mow half. We’ve even had neighbors come over and ask if they can push it around, and they reminisce about the good old days. Once you try one, you’ll never want to crank up the gas mower again. The smell of gas and grass is not pleasant, and it’s useless energy consumption. The reel mower is so much more fun, energy conscious, good-smelling, and easy. Give it a try. After searching the internet and garage sales for a used one, we went to Sears Hardware and bought one for less than $100. Do a little fall cleaning and push that gas mower to the curb or the thrift store. Terra, This is your best post yet! You could sell push mowers with this post. It had a smile on my face the entire time I was reading it. We have a push mower, I don’t fight to mow the lawn though. (I wish someone would fight me for my vacuum cleaner). Your brother even has a push mower. 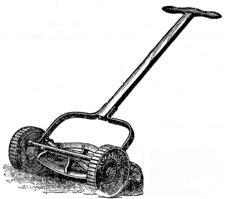 If anyone knew your brother, well in the olden days, they would be shocked to hear he even knew what a mower was. Kidding! Great article! I didn’t know you had a push mower! Is it a reel one like mine? I just love it. They’re catching on! My neighbors now have an electric mower. I think they’re around $200-250. I had one for years when I had a postage stamp lot. I remember how neat the cut was and the sound is interesting too.